Do you want to enrich your spiritual life? Would you like to be a better Catholic? 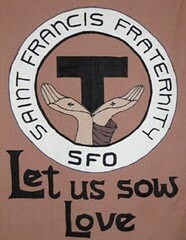 Then you may have a vocation to the Secular Franciscan Order (OFS). For over fifty years St Francis Fraternity comprised of lay Catholics, married and single, have followed a way of life or Rule instituted by St. Francis himself in 1221. Living the Gospel life as a member of the Secular Franciscan Order (OFS) can help you find direction, inspiration, encouragement, and support to reach your spiritual goals. Are you eligible? Admission is open to all Catholic men and women not members of another religious order or secular order and 18 years or older. Candidates must be practicing Catholics faithful to the teachings of the Church and loyal to the Apostolic See.